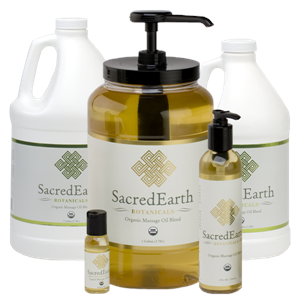 SacredEarth Botanicals' massage oil is handcrafted with only the finest USDA Certified Organic oils. The massage oil blend is light, glides easily over the surface yet provides enough drag to be excellent for deep tissue work. Very concentrated, a small amount of this oil will provide several minutes of workability and your clients will leave the table feeling like their skin has just been moisturized, not greasy. Sunflower Oil: Rich in essential fatty acids and vitamin E to aid skin hydration. The smooth, silky texture of Sunflower oil gives the SEB massage blend its great glide. Safflower Oil: This oil is extremely high in linoleic acid, a key component to moisturizing dry skin and keeping skin hydrated. Your clients will appreciate its light feel. Olive Oil: Our olive oil has been filtered to remove the tannins leaving an amazing emollient that will prevent the loss of moisture from the skin and will not clog pores. Jojoba Oil: Our olive oil has been filtered to remove the tannins leaving an amazing emollient that will prevent the loss of moisture from the skin and will not clog pores. 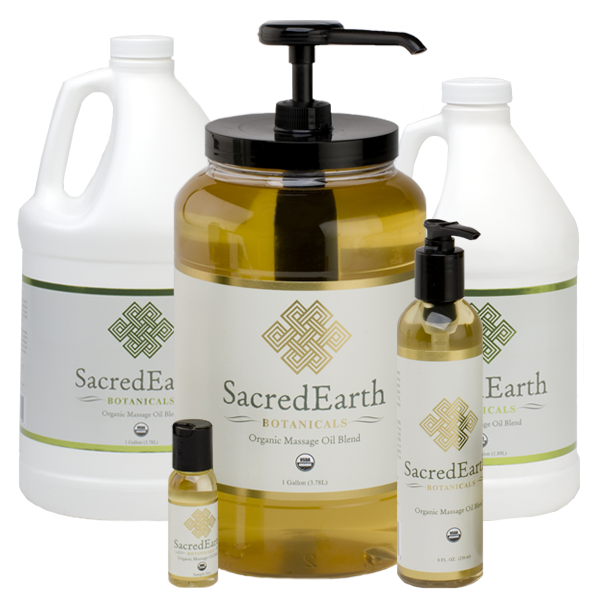 Sacred Earth Botanicals blessed a spa I work at with this oil after two feet of water devastated it during hurricane Sandy. I fell in love! As they claim, it is a great balance between glide and absorbtion, and a little goes a long way. It has no scent, which makes it perfect as a carrier for aromatherapy, and the jojoba gives it amazing shelf life without rancidity.